AccurioPro Label Impose is now available in version 1.0.6 and has received some new features with the latest updates. The innovations of the last versions are summarized for you in this article. 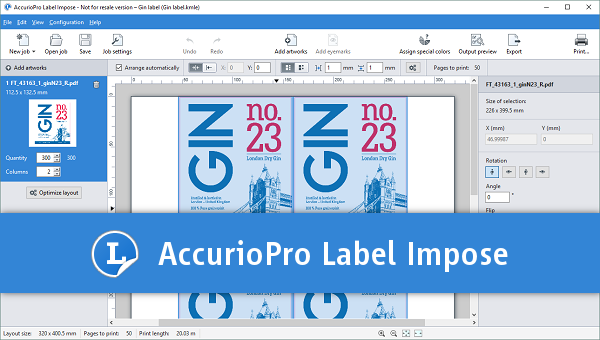 AccurioPro Label Impose, a software solution for fast and efficient ganging of labels specifically designed for Konica Minolta's label printers, has been released in version 1.0.6. We already introduced the basic functions. These include the automated imposition of labels with optimal material utilization as well as the recognition of information embedded in the print file, e.g. for the creation of the die cut tool or for further processing (varnishing etc.). Artworks can now be moved directly from the artwork list to the main canvas via drag & drop. Additional decimal places allow a more accurate positioning of the artworks. The default setting for the print mode was changed to "Hold print job". Konica Minolta's new label printer AccurioLabel 190 is supported. The software is now also available in the following languages: Chinese (traditional, simplified), Japanese, Korean. A Software Maintenance Plan (SMP) can be purchased which allows to update the application to future versions. The first year is also included retroactively in the case of licenses already purchased. In order to receive the latest version, please get in contact with your local Konica Minolta partner.